Quiet location with very friendly staff and traditional restaurant dishes. Excellent quality and maximum friendliness. It was more than I could ever eat and the food was top quality and diverse. I was a little spoiled as I was the only guest in that morning, still, it was top! The location, although on the outskirts is well accesible by bus or approximately 20 minutes walking from the terminus station of U1 subway line. The great thing about this location is that it's really quiet with lots of vegetation around. The staff speaks well English. The room was perfectly clean and the breakfast was just enough, selection of cold meats, cheese, boiled eggs, jams, yoghurt, milk, coffee and pastries. La localisation est proche du salon ECS, dans une zone assez calme et facile d'accès. Le restaurant est correct et bon marché. La chambre est petite mais bien agencée avec un bureau. Es gab kein Frühstück; die Bedienung hat verschlafen. Ersatz gab es keinen. 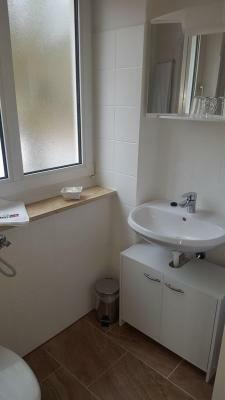 Zimmer war sehr schön, ziemlich neu! Die Pizza war auch super! Das Zimmer war völlig ausreichend ausgestattet und geschmackvoll eingerichtet. Bei unserem Eintreffen wurde auf einen Sonderwunsch unkompliziert eingegangen, geprüft und umgehend entsprochen. Absolut professionelles und zuvorkommendes Verhalten des Personals....top!!! Es war Messezeit. Gewöhnlich sind dann alle Hotels deutlich teurer. 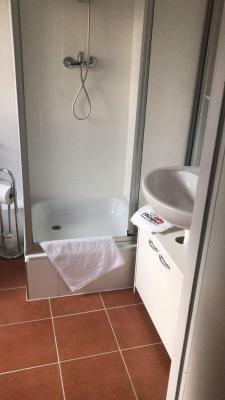 Zimmer war OK, einfach, aber neu und sauber. Bad etwas klein. Lage außerhalb, aber ca. 15 Minuten bis zur S-Bahn. Leider gab es an einem Morgen Frühstück erst ab 08.20 Uhr, da die Besitzerin verschlafen hatte. Geht gar nicht, wenn man Termin hat. Zollhaus Erlebnispark Restaurant und Biergarten is located in Nuremberg, 2.7 miles from Nürnberg Convention Center, and provides free WiFi. The property is around 3.6 miles from Documentation Center Nazi Party Rally Grounds, 3.8 miles from Meistersingerhalle Congress & Event Hall and 3.9 miles from Max-Morlock-Stadion. Italian cuisine is served at the restaurant. At the guesthouse, rooms have a closet. 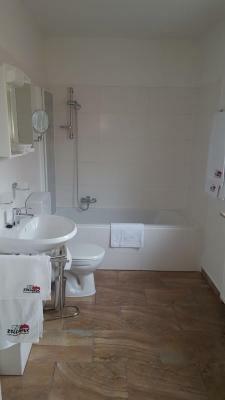 Rooms come with a private bathroom with free toiletries. At Zollhaus Erlebnispark Restaurant und Biergarten rooms are equipped with a flat-screen TV with satellite channels. Zollhaus Erlebnispark Restaurant und Biergarten has a playground. Nuremberg Christmas Market is 6 miles from the guesthouse, while Old Town Nuremberg is 6 miles from the property. Nurnberg Airport is 9 miles away. When would you like to stay at Zollhaus Erlebnispark Restaurant und Biergarten? This single room has a cable TV, tile/marble floor and dining area. This single room features a tile/marble floor, flat-screen TV and dining area. This double room has a tile/marble floor, dining area and garden view. This double room features a sofa, dining area and cable TV. This double room features a sofa, dining area and tile/marble floor. House Rules Zollhaus Erlebnispark Restaurant und Biergarten takes special requests – add in the next step! Debit card Zollhaus Erlebnispark Restaurant und Biergarten accepts these cards and reserves the right to temporarily hold an amount prior to arrival. Zollhaus Erlebnispark Restaurant und Biergarten accepts these cards and reserves the right to temporarily hold an amount prior to arrival. It would have been better if the food menu was in English too but I guess this adds to the traditional German character of the place.